The first quarter of the year started well for Read SA. In a coup for the campaign, we partnered up with Centre for Creative Arts to give more value to Time of the Writer Festival. Those who have been part of Time of the Writer since its inception will know what a fantastic literary event it is. In addition to the panel discussions that happen every evening during the course of the week, writers get to visit schools and Durban Westville Prison to talk about their art. In the past, these visits have consisted of schools receiving biographies of the visiting writer and an excerpt of their work to familiarise themselves with it. This year through Read SA’s partnership, we added value to an already fun and enriching experience for the students. Writers arrived at each of the schools they visited with a box of books to give to the library of the school being visited. Through this, Read SA and Centre for Creative Arts were able to distribute books worth R50,000 in Durban high schools. As the mission of the campaign is to spread the love of reading through reading South Africa and Africa, we also took four children’s writers to donate books and conduct writing workshops with students from five primary schools in Pietemaritzburg. Zambian writer Ellen Banda-Aaku, Congolese writer Mukanda Mulemfo, and Zimbabwean writer Ivor Hartmann took part in this leg of the campaign. What was gratifying for Read SA was how effortless the logistics of the visit were as the Pietermaritzburg community, led by English teacher Amisha Aiyer of Orient Heights Primary School, rolled up their sleeves and ensured everything was smooth sailing. Not only did they arrange transport from and to King Shaka Airport for the writers, one of the parents, aware that the campaign has limited funding so far, even paid for accommodation for one of the writers. As is clear from this, Read SA is gaining momentum and we look forward to more work in different provinces. All being well, we hope to have visited schools and communities in all nine provinces of the country by the end of the year, donating books and getting people to read and read South Africa. Book Now for the Read SA “Meet the Writers” London Event! 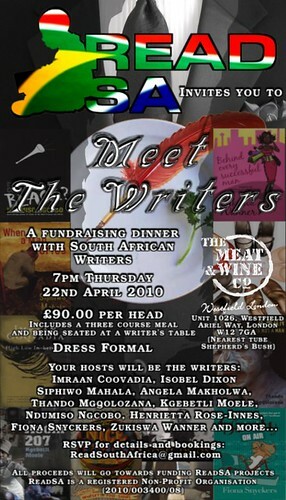 Read SA invites you to “Meet the Writers” at a special event in London the day after the conclusion of the London Book Fair. Join us at The Meat & Wine Co., Westfield London, on Thursday April 22 at 7pm (click here for map). Your hosts will be the South African writers Imraan Coovadia, Siphiwo Mahala, Angela Makholwa, Thando Mgqolozana, Kgebetli Moele, Ndumiso Ngcobo, Fiona Snyckers, Zukiswa Wanner and more! Bookings are just £90 per person and include a three-course meal and seating at a writer’s table. All proceeds from the event go to Read SA, a registered non-profit organisation that aims to boost the profile of South African writing locally and abroad. Write to ReadSouthAfrica@gmail.com for details and to book. We look forward to welcoming you in London! This is not something I’ve done before, mind you. I bought him on Saturday afternoon, for R550, and what an interesting experience it was. I felt like, all empowered and stuff, expressing the power my corporate salary confers upon me and using it to turn stereotypes on their head, yadda yadda, and all in the name of a good cause. My Wits gender studies lecturer would have been so proud. The people behind ReadSA, an organisation dedicated to the promotion of reading in South Africa in general, and the reading of South African literature in particular, decided to do something a little different in order to raise funds. The result was a Hot Man Auction, hosted at the Melville abode of a German arts benefactor. The recent merger of South Africa’s two most prominent book publishers, Random House and Struik Publishers, resulted in the formation of Random House Struik. The newly formed company is the largest general trade publisher in Southern Africa, and is now leading the way with creative writing education. Random House Struik has partnered with Getsmarter, a specialist internet-based training company, to present the part-time Random House Struik Short Course in Creative writing. As the course is offered via the Internet, both local and international students will be accepted on the course. The Random House Struik Short Course in Creative writing is a 10-week part-time course presented internationally in an internet-based distance learning format. The course is ideal for anyone who has dreamt of writing a novel or a short story as well as accomplished writers, fiction or non-fiction, who wish to bring more flair and drama to their work. The course is compiled and convened by American professional literary agent, editor and author Ron Irwin. Getsmarter’s advanced and user-friendly learning model provides students with a personal and professional educational experience. Students work through the course material together mirroring a typical face-to-face classroom environment online and receive continuous academic and administrative assistance throughout the duration of the course. Each of the 10 modules includes course notes; discussion forums where students interact with one another; an interactive “test your knowledge” quiz as well as video lectures to make the course material engaging. The course module titles include planning the story; the importance of beginnings; characters and characterization; plot vs. story; dialogue; point of view; conflict; and tying it all up. In addition to the core coursework, students become part of a network of writers. This means that as the course progresses, students not only make friends with fellow writers; share creative writing pieces, contacts and ideas, but are also given the opportunity to review each others work and receive rich personal feedback on their work. A further benefit of this course is that Random House Struik have committed to read and consider the top manuscripts from the course. The course is due to start on the 22nd of February 2010 and registrations close on the 12th of February 2010. Please contact Karin on +27 21 683 3633 or karin@getsmarter.biz for further information. Become a ReadSA Facebook Fan!